More information is available at the DOC website.. Click Here. Aspiring National Park covers an area extending from the Haast River in the north to near Glenorchy in the south. It encloses this section of the Southern Alps. It is accessible from most sides, Highway 6 and Makarora in the northeast, Okuru / Jacksons Bay on the west, Queenstown / Glenorchy in the south, and Wanaka in the east. The main Visitor Information Centre for the park is located in Wanaka, however there a information centres at Makarora, Queenstown, Glenorchy and Haast that can assist with Park information. The Park is named after its highest peak, Mt Aspiring (3030m), which sits west of the Divide in the centre of the Park. It has no competition from surrounding summits and so rules the skyline, with its spectacular sabre shape. It is however, very concealed in its alpine wilderness environment, being seen from only a handful of sites about the Park. The Park is extremely diverse, with huge rock & ice mountains, large sweeping glaciers, rich forest, and wet, wet rainforest, an almost impossible number of waterfalls, and then more during rain (5000mm of per year), excellent tramping opportunities, and some of the best mountaineering in New Zealand. Some of the best tramping in New Zealand is within the Park's boundaries, tramps can be suited to most levels of experience. Getting good track and weather information is essential for any tramp in Aspiring. The Routeburn Track stradles both aspiring and Fiordland National Park, and is the most accessible and easiest of longer tramps in the Park. 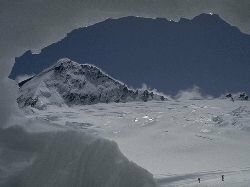 For those more adventurous and with some Alpine experience, look into the Rees / Dart, Matukituki or Cascade Saddle routes. If you have good alpine experience & knowledge, French Ridge may appeal. Everything under the sun, or the rain cloud as the case may well be, it depends where you are about the Park's perimeter, but most styles of accommodation to suit most budgets are available. Again it depends where you are, the larger towns, Wanaka / Queenstown have everything, while places like Makarora & Haast have very little, or just enough to survive. If in doubt check ahead.